Question-PMA Design has been an industry leader in the hospitality design sector for three decades. 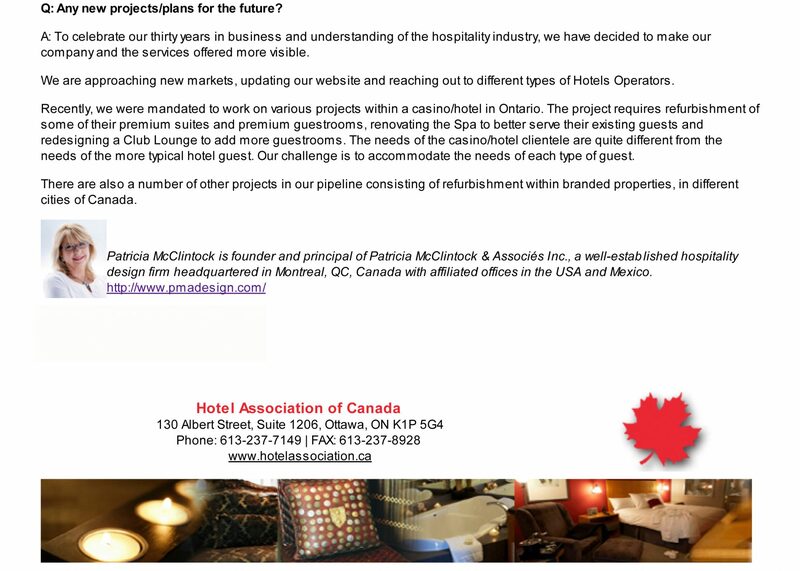 Would you say you understand the industry, what hotels are looking for and what they require when it comes to design? For the last three decades, PMA Design has been involved with the hospitality industry either by designing interior spaces for new builds and/or renovating and refurbishing existing properties. As our business is established in Canada, we have not had the luxury of specializing in a specific type of property or Brand. On the contrary, we have had the good fortune of working on many different types of hotels and Brands, each aimed for a different and specific targeted market. This has allowed PMA Design to have a better understanding of the hospitality industry in general and more specifically how thru design implementation, whether independently owned or Branded, each of these properties responds to the needs of the market segments targeted. Hotels, as any other business, aims at increasing their market share and design is a way to make their properties more appealing, which brings more guests. Question-What makes PMA Design stand out above the rest? At PMA Design we are always listening to our client’s needs, understanding the niche market they are targeting, working within the parameters of their budgets, respecting the constraints of their timelines, providing the same quality of service and attention to details, regardless of the type of property being designed or refurbished. PMA Design aims at insuring that thru good and functional design, we contribute in assisting our client’s to achieve their goals and success. Question-Hotel design involves a lot of planning, what advice do you give to your clients? Hotel design involves more than just good and functional planning. It involves creating environments welcoming to the different types of clients and needs of the specific market segment targeted. It involves understanding the relation between rates of a guest room and the cost of the furnishing of room. It involves understanding the procurement process and where to source these FF&E’s. It involves advising the client when and where to value engineer. This analysis has been as accurate as possible in order to strategize with the client/hotel the right design-planning direction. Question-What are the most important things to consider when planning a re-design? When planning a re-design it is important to understand the needs and requests of the existing client base, yet be attractive for an expanding and new client base. It is important to acknowledge the needs of a younger generation, whose expectations differ from that of baby boomers generation. It is also a must to provide the guest with an excellent and restful sleep, but also with all the proper amenities allowing the same guest to use all of his available technology. Question-How has environmental sustainability played into design? At PMA Design, whenever possible, we like to specify sustainable products. In addition, we have been practicing the habit of encouraging our Canadian and local manufacturers and suppliers for case goods and any other products and services. While we do have some clients whose first priority is budget, we try to explain and educate them about the benefits of specifying and purchasing Canadian made; first, because they would be supporting the domestic industry and second, because they would be saving time and excessive freight charges, which also affects negatively the environmental sustainability. Question-Any projects/plans for the future? To celebrate our thirty years in business and understanding of the hospitality industry, we have decided to make our company and the services offered more visible. We are approaching new markets, updating our website and reaching out to different types of Hotels Operators. Recently, we were mandated to work on various projects within a Casino/Hotel in Ontario. The project requires refurbishment of some of their premium suites and premium guestrooms, renovating the Spa to better serve their existing guests and redesigning a Club Lounge to add more guestrooms. The needs of the Casino/Hotel clientele are quite different from the needs of the more typical hotel guest. Our challenge is to accommodate the needs of each type of guest. There are also a number of other projects in our pipeline consisting of refurbishment within branded properties, in different cities of Canada. 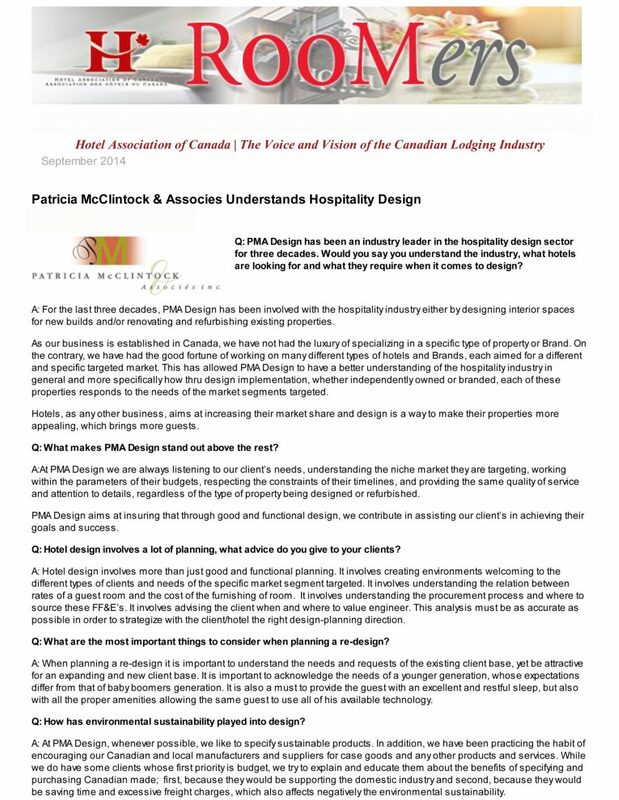 P’s photo- Patricia McClintock is founder and principal of Patricia McClintock & Associés inc., a well-establish hospitality design firm headquartered in Montreal, QC., Canada, with affiliated offices in the USA and Mexico.